I you change your e-mail address it is essential that you change your registered e-mail address here to. Many functions that require a valid e-mail address will no longer be available if the registered e-mail address is no longer available. To change your registered e-mail address click the Change E-mail Address link in the menu. Because of the obvious security issues involved with changing e-mail addresses the change e-mail form requires most of your registered information. You are required to fill in all the fields. After you have submitted the form and your information is accepted you will be logged out and an e-mail sent to the new e-mail address. This e-mail will contain a link that you need to click confirming your e-mail address. 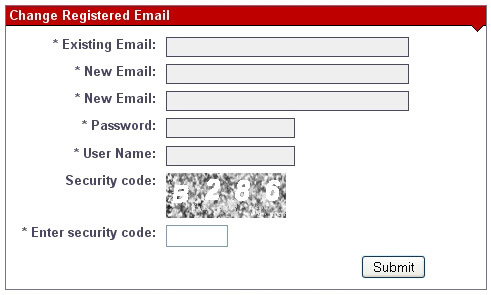 Once confirmed you can login using this new e-mail address and your existing password. Please note that the most common reason for users having problems is system e-mails being caught up in spam filters. If you do receive an e-mail from the Crossword Compiler please make sure that this is not the case. If it is the case you need to make sure that all e-mails from the Crossword Compiler are accepted.